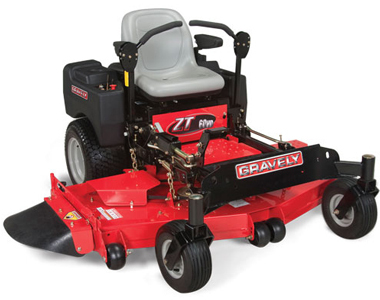 The Gravely ZT HD 48 is the ideal zero turn for homeowners with large, hilly yards. A large 48” cutting deck consisting of 3 blades is sure to cut your mowing time down so you can spend more time enjoying your yard instead of mowing it. The powerful 25 HP Kohler Engine has Simple Smart-Choke™ easy starting technology makes getting your mower started easier than ever. The heavy duty mowing deck is made of 10-gauge welded steel which is sure to stand the test of time, plus electric PTO blade engagement makes it easy to start and stop blade rotation while on the go. Easily raise and lower the mower deck with a mechanical foot lift. A plush high-back seat with springs and arm rests is sure to give you maximum comfort while you mow. This mower has it all, power, comfort and convenience. Simple Smart-Choke™: Easy starting technology, don’t waste time trying to get your mower fired up. Large Cutting Deck:48" cutting deck with 3 blades helps you cover more area in less time! Hydrostatic Transmissions: Dual Hydro-Gear ZT-3100 Hydrostatic Transmissions make changing speeds easy with infinitely variable speed control. Durable Mower Deck: Made of 10-gauge welded steel w/ ¼” spindle reinforcement . Electric PTO Engagement: Ogura GT1A Electric PTO engagement means you can easily start and stop blade rotation as you like. 4-Point Commercial-Style Deck Hanging System: Provides extra deck stability to ensure less deck movement. Maximum Operator Comfort: Arm rests and a plush high back seat with springs are sure to help keep you comfortable while you are mowing. Speed Forward (min, max) 0-8 mph. Speed Reverse (min, max) 0-4 mph. Tire Size (front, rear) Front - 13" x 5"
Rear - 20" x 10"
Cutting Height (min-max) 1" - 5"
Width (in.) Chute Up - 50"
Click the button below to add the Gravely ZT HD 48 48" 25 HP (Kohler) Zero Turn to your wish list.